The title has a double meaning. The monochromatic ivory tones combined with the double black-core mat and the black beads is pretty dramatic. But it also posed a hefty design challenge for me and resulted in more than a few heavy sighs! I discovered my long hiatus from paper filigree had substantially dulled my design skills, and having to rely solely upon textures, weight and placement and not as heavily upon color was harder than I expected, especially when combined with the striking edges of the mat. It took a good deal of time to find a layout that helped draw the eye around the entire composition rather than hone right onto the mat lines. The customer sent along the original envelopes with her 41 year old invite (how's that for a testament of enduring love?) hoping that I could incorporate them into the piece. 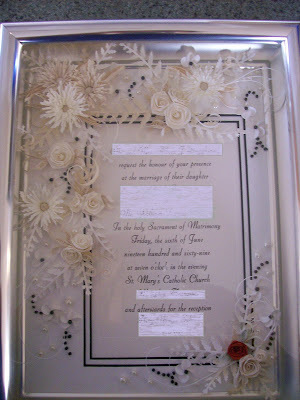 I loved the idea as soon as she mentioned it, and used the creamy envelope paper to create circle-punch 'frosting flowers' and some of the fern foliage. I'm curious to know if anyone else has worked with monochromatic designs and discovered, like me, that it was more challenging than it looks! We baked 8 pies on Saturday for a fund-raising dinner. The girls and I baked another 14 today - 10 that were auctioned off in pairs at the previously mentioned dinner. Here are the last 4 that need to be delivered. 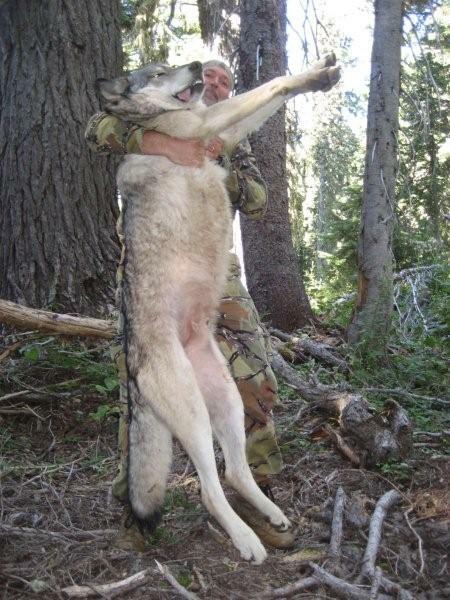 Think Idaho might have a wolf problem? I don't have any credit info to give - this photo was recently sent to me and I am trying to track down info. I was told it was bagged near Clarkia, Idaho and the hunter is 6'5"
That is a huge predator....how'd you like this monster roaming nearby where your young children....or not so young...are playing near the edges of your property? A friend recently shared this short film and I had to pass it on. Readers may recall when the inspirational life of Nick Vujicic was blogged about here at 'Twirl'. He is featured in this film of compassion and hope. I hope you will click to link watch it and leave a comment. This film left me in a soggy puddle of emotions as I once again commit to seeing the butterfly locked within the ugly caterpiller of difficult circumstances or difficult people that I encounter in my own life. An affirmation of true value and worth. Wonderful historic resource now available on-line! I have referenced this wonderful booklet numerous times in the past, written by Malinda Florian Papp from Florian Papp Antiques in New York City. This brochure was prepared for an art exhibit of historic paper filigree pieces that they arranged in the 80's I believe. 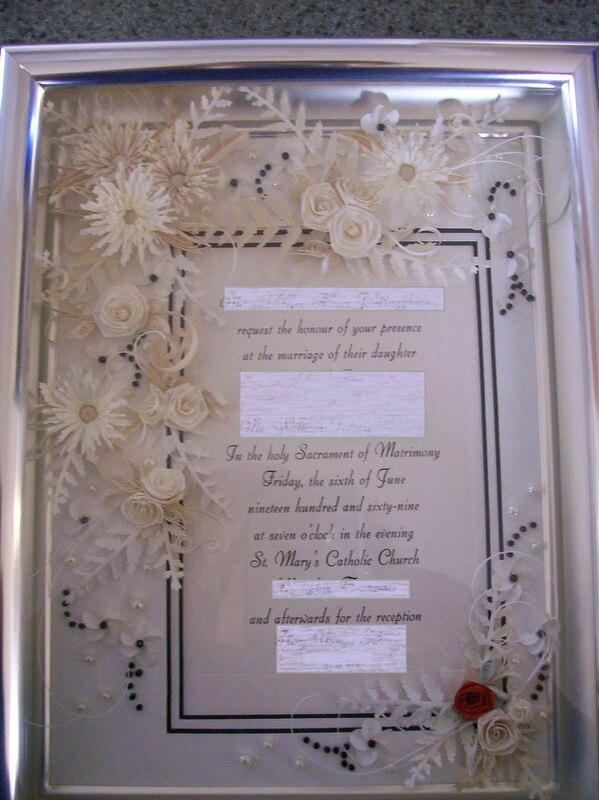 The brochure contains beautiful, full-colored photos of antique paper filigree pieces and historical information on the art of paper filigree. Because of the continued demand for this booklet, which is out of print, Mindy decided to offer it as an electronic document. I received the file in my in-box yesterday and immediately contacted them for permission to upload it to Scribd.com, a file sharing site. Florian-Papp graciously extended permission...and the result is that everybody has instant access to this wonderful resource.